Across the inner city there was a sigh of relief when a new location for Sydney’s second airport was finally announced earlier this year. Throughout our Regional Council’s almost 40 years of work in the Inner City, issues connected to Sydney’s airport and a proposed second airport, have been a constant. 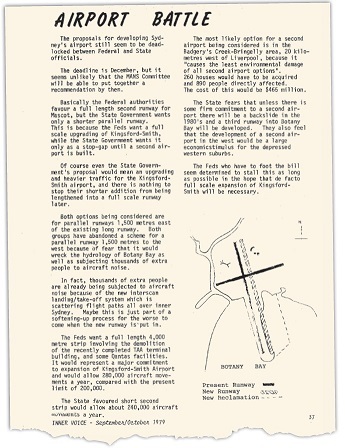 An example is the article below from Inner Voice in October 1979 which describes the then federal – state standoff over a new airport and the third runway. In 1979 we predicted Badgery’s Creek was the best location. We await the revamp of the Sydney Metropolitan Strategy which should now include the new airport and deliver on the economic stimulus potential it can bring to the western suburbs. Sometimes change takes a long time! The proposals for developing Syd­ney’s airport still seem to be deadlocked between Federal and State officials. The deadline is December, but it seems unlikely that the MANS Committee will be able to put together a recommendation by then. Basically the Federal authorities favour a full length second runway for Mascot, but the State Government wants only a shorter parallel runway. This is because the Feds want a full scale upgrading of Kingsford-Smith, while the State Government wants it only as a stop-gap until a second air­port is built. Of course even the State Govern­ment’s proposal would mean an upgrading and heavier traffic for the Kingsford-Smith airport, and there is nothing to stop their shorter addition from being lengthened into a full scale runway later. Both options being considered are for parallel runways 1,500 metres east of the existing long runway. Both groups have abandoned a scheme for a parallel runway 1,500 metres to the west because of fear that it would wreck the hydrology of Botany Bay as well as subjecting thousands of extra people to aircraft noise. In fact, thousands of extra people are already being subjected to aircraft noise because of the new interscan landing/take-off system which is scattering flight paths all over inner Sydney. Maybe this is just part of a softening-up process for the worse to come when the new runway is put in. The Feds want a full length 4,000 metre strip involving the demolition of the recently completed TAA terminal building, and some Qantas facilities. It would represent a major commitment to expansion of Kingsford-Smith Airport and would allow 280,000 aircraft move­ments a year, compared with the present limit of 200,000. The State favoured short second strip would allow about 240,000 aircraft movements a year. The most likely option for a second airport being considered is in the Badgery’s Creek – Bringelly area, 20 kilo­metres west of Liverpool, because it “causes the least environmental damage of all second airport options”. 260 houses would have to be acquired and 890 people directly affected. The cost of this would be $465 million. The State fears that unless there is some firm commitment to a second air­port there will be a backslide in the 1980’s and a third runway into Botany Bay will be developed. They also feel that the development of a second air­port in the west would be a large economic stimulus for the depressed western suburbs. The Feds who have to foot the bill seem determined to stall this as long as possible in the hope that defacto full scale expansion of Kingsford-Smith will be necessary.